2. Plug the USB and audio connector into the related interfaces on adapter. 3. Insert the HDMI cable into the adapter and the HDMI interface on TV/Monitor. (HDMI cable should be purchased separately). ● If the product is not working, may be due to long-distance transport part of the product is damaged, you can apply for a change. ● This converter is NOT bi-directional, only support from VGA to HDMI Displays. Can NOT be used as a HDMI-to-VGA converter cable. ● The product need an external power supply, a USB cable is needed to supply power to make sure it can work perfectly (USB cable is included). ● An HDMI cable is also needed (HDMI cable not include). 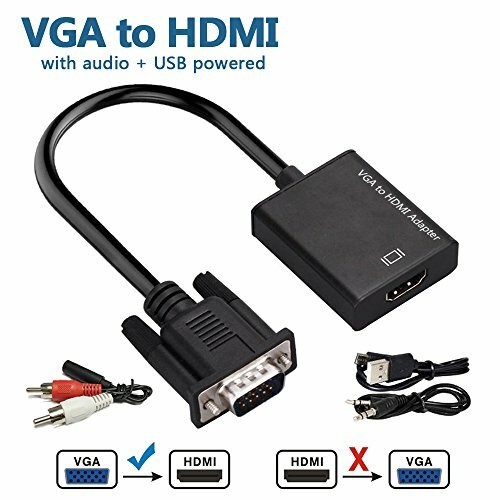 HIGH PERFORMANCE: VGA to HDMI adapter cable offers you a convenient way to connect PC, Notebook, Desktop computer with VGA output to displays such as projector, monitor, TV or display screen with HDMI. Then you can enjoy wonderful signal transmission for business use and entertainment. VIDEO AND AUDIO SYNCHRONOUSLY: HDMI output supports video resolution up to 720P/1080i/1080P; VGA input supports resolution from 800*600 to 1920*1080; Transmit stereo audio via 3.5mm Audio cable. USER-FRIENDLY DESIGN: Plug&play, easy to use, no driver needed. There is a signal light on the VGA to HDMI Scaler.The light will flash when the HDMI equipment connect the LED lamp, and will extinguish if the product is disconnected. The signal light will indicate the working condition of the HDMI output side. WIDE COMPATIBILITY: Work with PC, laptop, TV,TV-Box and other VGA output devices. HDMI port can be connected to projectors, HDTV, monitors/Displayer and other device with HDMI port. NOTE: This converter is NOT bi-directional, only support from VGA to HDMI Displays. Can NOT be used as a HDMI-to-VGA converter cable. The product need an external power supply, a USB cable is needed to supply power to make sure it can work perfectly (USB cable is included). An HDMI cable is also needed (HDMI cable not include). If you have any questions about this product by ShiningDay, contact us by completing and submitting the form below. If you are looking for a specif part number, please include it with your message.